The Queen Charlotte's Crown quilt block is not one I have seen in a lot of quilts but it struck me as a lovely use of colour and it is a little unusual in the look of the block -- something that strikes me. (I like unusual). 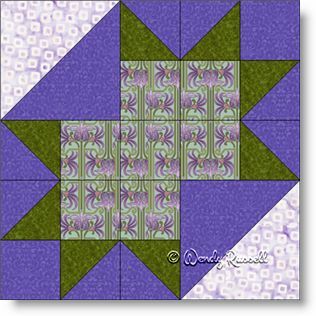 This five patch quilt block is comprised solely of squares and half square triangles so it is an easy block to construct as an uneven nine patch. In the two sample quilts shown, I have chosen to use the quilt block in groupings of four, rotating the blocks to make different designs. The use of sashing adds additional colour to the final quilts.